I am into fast, easy, all natural, healthy, kosher cooking AND living. This past Shabbat, Aunty Elle, my sister-in-law came over. We were very excited! She was our first guest in our new home. The weather, however, was hot and humid. Raizel, Aunty Elle and I all have different types of curly hair. In humid weather, our hair becomes hopelessly frizzy. Aunty Elle bought herself an expensive hair spritzer to make her hair less frizzy. 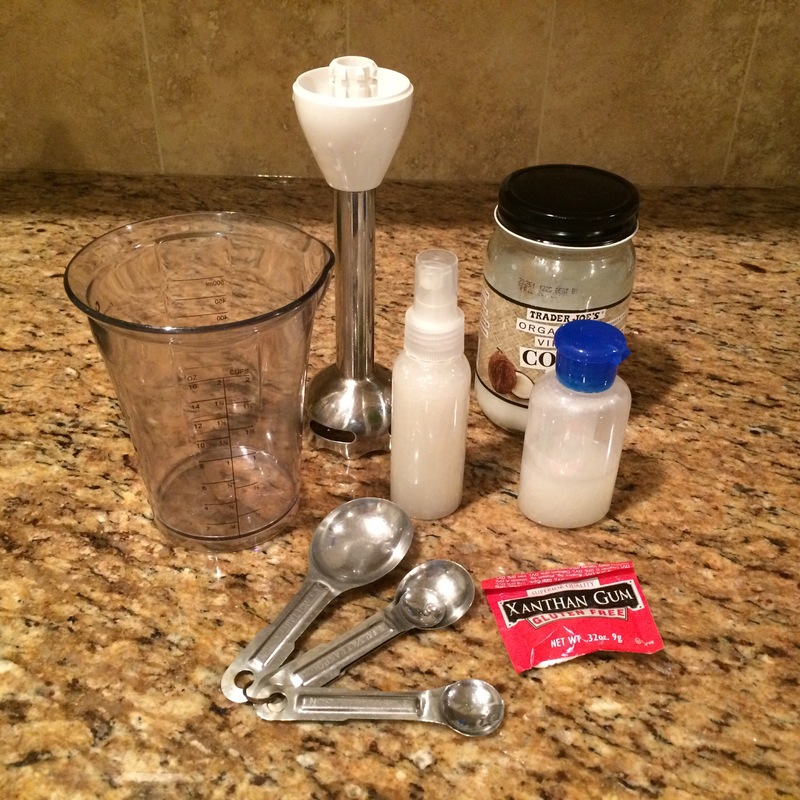 This is my first attempt at making anti-frizz hair spritzer, or leave in conditioner. Optional: essential oil of your choice. Place water, oil and xanthum gum in container. Blend until thickened with immersion blender. Store in spritz bottle. I used it on Raizel this morning and it worked well. Aunty Elle said that it worked really well too. She said that her hair was soft and manageable. The disadvantage was that her hair was less stiff than with the commercial product. The advantages were: no additives, dyes, chemicals or preservatives. In addition it is also environmentally friendly, biodegradable and economical. I think that is definitely worth it! It is possible to add essential oils, for an aromatheraputic effect. I personally do like like perfume. But, it could be easily added, according to your preference. I am giving out samples to my co-workers and our therapists. Great idea! Also love a use for xanthan gum other than gluten free cooking! It really works! I think just only make enough for 1 month supply at a time. This is really good and so simple. Thanks Parul! This is great Carol.. I would love to give this a try but I’m not sure I can find xanthum gum here. Any other alternative? By the way I have moderately straight hair and yet it gets so frizzy. I can’t oil it every day due to the climate here so I usually stick to a leave on conditioner. The original recipe called for guar gum. I have also heard that flax seeds also work. I would say just use straight coconut oil, but that is maybe too heavy for straight hair. I am going to put my thinking cap on and find an alternative. You are inspiring me! I know that it is possible. What did people do before the days of conditioner? True. I have to be careful with Yaffa’s hair because it is straight and I don’t want her to look greasy. I think I found something but I am not sure if it addresses the frizz problem. So interesting that your family used coconut oil. I had never heard of it until I met people from the Caribbean. There, what they can do with coconut is a work of art. I found something: mix 1/4 cup of distilled water or if you want to be fancy, aloe Vera juice and 1 tablespoon of coconut milk. Essential oils as desired. I haven’t tried it yet, but I just bought some coconut milk. Great to see your ingenuity in progress. A product like this is so much safer than the products we see on the shelves in the stores. Very funny! My husband says the same thing! Really though, the long list of unpronounceable ingredients in beauty products is alarming. It cannot be healthy to have so many artificial substances absorbed through the skin. Perfecto! I’m also glad you had your first guest to your new home … I always feel this to be very important – symbolising real home-coming in some way. I’m in your husband’s camp at some level so my husband can put his feet up in the sure knowledge that it will all be done swiftly and with no input from him!!! Ha! Ha! That is an excellent strategy. I only wish I was so organized. 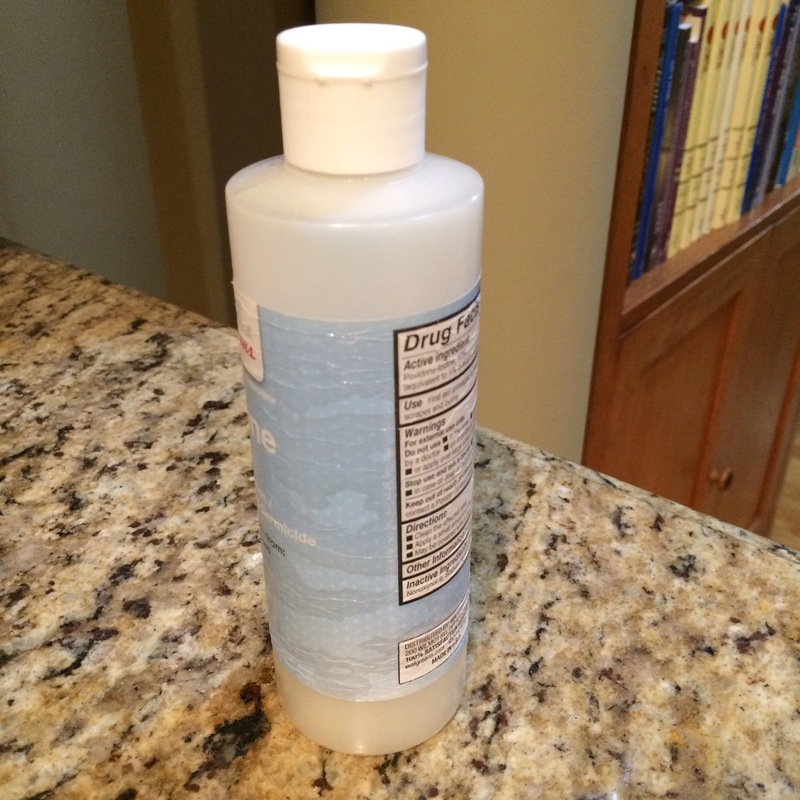 Thank you for sharing this….my hair gets so frizzy now that it’s grown back from chemo…have to try! Thank you so much! I’m following your wonderful blog! Welcome! I am so happy to meet you. I love reading your recipes! Gives me a break from my projects! I am so glad. This blog is my creative outlet. It gives me a break from what is otherwise a very intense life. It really works. It’s not the same, but it is a fraction of the expense. I am going to experiment with other methods too. Commercial beauty products are full of toxins which cannot be good to use on a daily basis.